My Easter cooking is in full swing! 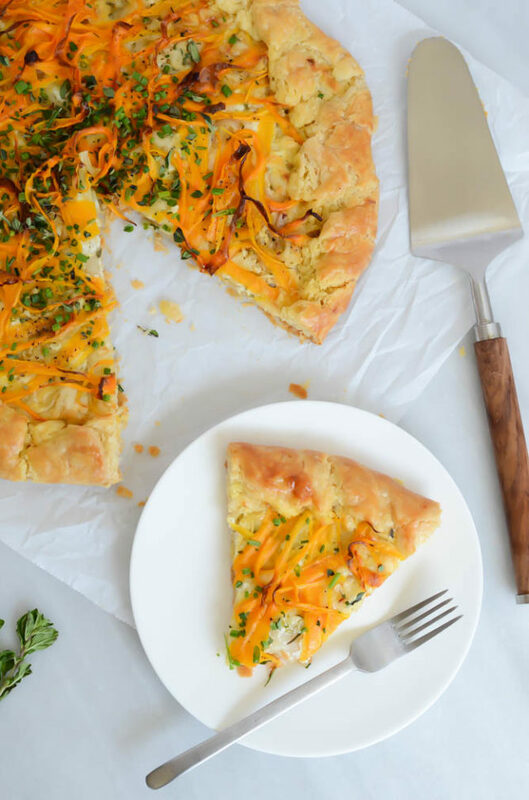 I’m getting in all of the Easter-y dishes I can now since we’ll be on an airplane to Italy on Easter Sunday, and I just can’t pass up all of the delicious dishes I’ve been dying to make for the holiday, like this Herbed Carrot Galette! Seriously, if we were having any sort of Easter brunch, this galette would be the star of the menu. 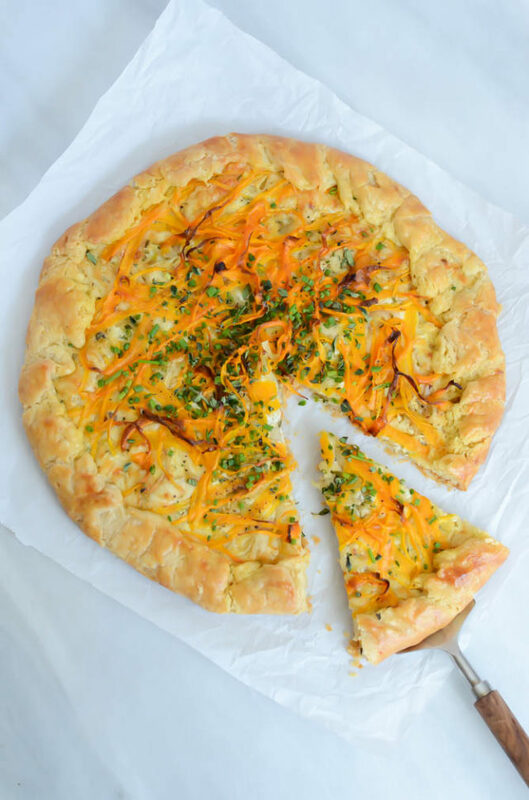 It starts with a buttery, flaky crust that is graced with a creamy herb-studded mascarpone, all topped with shallots, garlic, thinly-shaved carrots and even more herbs. I mean, can we really go wrong? I think not. I’ve been itching to make my own take on a galette ever since I was inspired by my gal Becky at Baking the Goods. She made a delicious Ricotta, Potato and Spring Pea Galette for our Spring Fling Brunch last month, and it was seriously the perfect addition to the menu. So when I found myself with a whole bag of leftover carrots after some recipe testing one day, I decided this would be the best way to put them to use. People often ask me how I keep coming up with recipe ideas and, truthfully, it’s never been a problem for me. I keep a running list of ideas on Google drive and Evernote, and just add ideas as I come up with them. Travel often provides a ton of inspiration for me, as do foodie magazines like Bon Appetit and Food & Wine. Also, family! I still have a ton of recipes I’m working on transcribing from the old family archives, and now I have my husband’s family recipes to work on as well. Other times, I’m simply inspired to make something by what I have in my refrigerator that might otherwise go to waste, like those carrots. I had actually bought them as a prop for some food photography, but I’m certainly not one for wasting any sort of food. 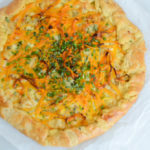 Now I have this Herbed Carrot Galette to thank for that! Seriously, though, this thing is pretty much to die for. It’s certainly not for the faint of heart (or the incredibly health-conscious) but, hey, it’s the holidays! We deserve to let loose every now and then. The incredible richness of the dish starts with a basic pate brisee dough for the crust. You can really use whatever pie or quiche dough recipe you prefer, just be sure not to use one that is heavily sweetened as we are making a completely savory dish. I turned to my good ol’ Bouchon Bakery cookbook for my recipe because, let’s face it, Thomas Keller can do no wrong when it comes to tasty, buttery baked goods. I’m sometimes a bit intimidated to dive into the complexity of Keller’s baking world, but I was pleasantly surprised to find that his pate brisee recipe comes together much more quickly and painlessly than other pie dough I’ve whipped up in the past. 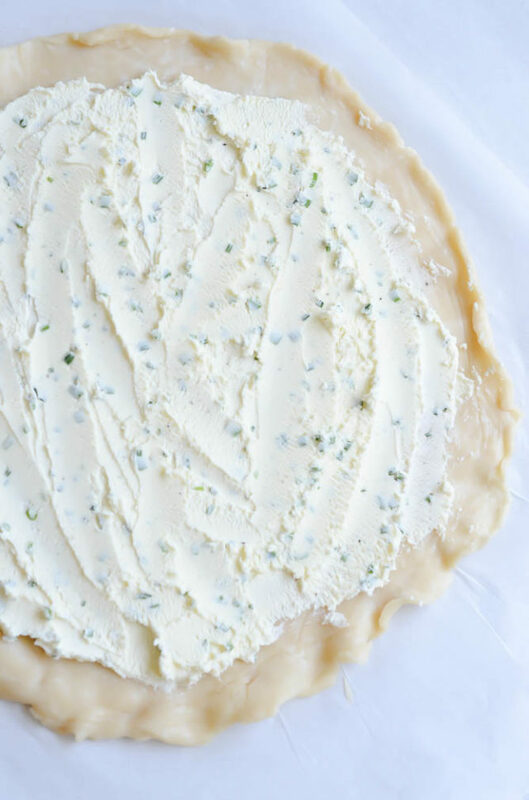 After the dough comes the toppings, and what better way to start us off than a creamy, chive-laden mascarpone spread. Again, incredibly easy. We’re talking dumping a healthy serving of freshly snipped chives, salt and pepper into a container’s worth of mascarpone, and stirring it up so you get all of that magnificent flavor in every single bite. But I couldn’t stop there with the cheese. Nope! I also sprinkled on some shredded fontina to add a sharp, salty kick to the mix. Not regretting it one bit. After we’re done loading the galette with cheese, we can move on to the veggies. 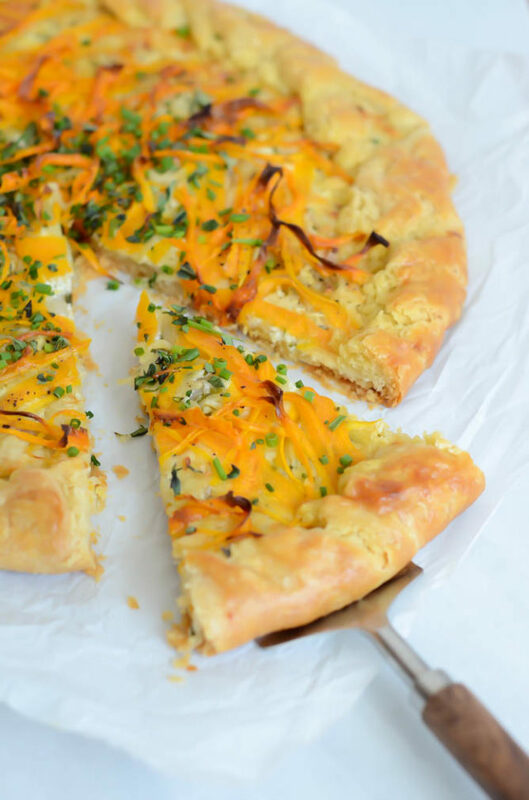 I wanted this Herbed Carrot Galette to really pop with flavor, so I added sliced garlic and shallots to the mix with the thinly shaved carrots. Keeping everything thinly sliced ensures that it will all cook properly (and even get some lovely golden-brown color) in the amount of time it takes to bake off the crust. I’m happy to report that it only takes about five minutes in the oven for the smell of this Herbed Carrot Galette to start wafting through the entire house. And it only takes another 40 or so minutes until the crust is golden-delicious enough for you to remove from the oven, sprinkle on some more fresh herbs, and enjoy to your heart’s content. 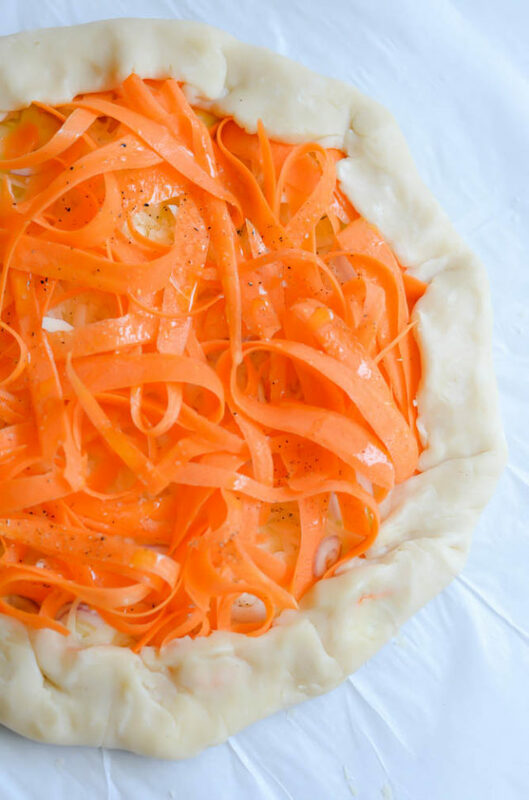 Now, I have one simple question to ask of you: Will all of you pleeeeease make this Herbed Carrot Galette in honor of me as part of your Easter menu? 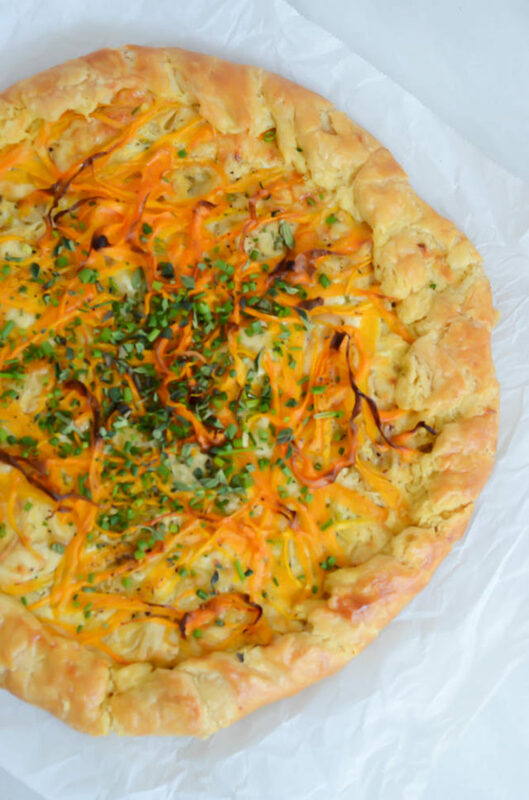 This savory galette showcases the best flavors of spring - crunchy carrots and fresh herbs complimented by two creamy, delicious cheeses. Place pate brisee dough between two pieces of parchment paper and roll into a circle about 16-inches in diameter and ¼-inch thick. In a small bowl, combine the mascarpone, 1 tablespoon chives, ¼ teaspoon salt and dash of pepper. Remove the top piece of parchment paper from the pate brisee and generously spread on the mascarpone, leaving about a 1 ½- to 2-inch border to fold the dough up and over the toppings. Next, sprinkle on the fontina cheese, then top with the garlic, shallots and finally, the carrots. Drizzle olive oil over top of the carrots and season lightly with salt and pepper. 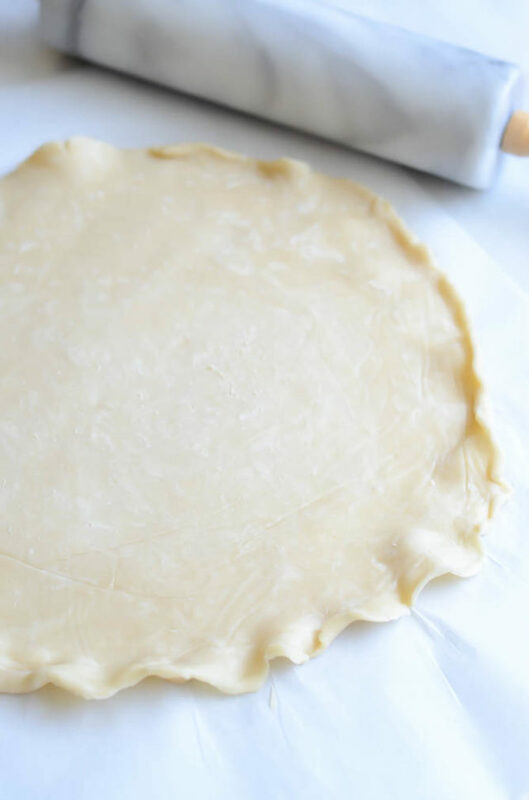 Working your way around the perimeter of the galette, fold up the edges of the dough, allowing them to naturally pleat as you go around in a circle. If any pieces crack, simply pinch them back together. Keeping the galette on the bottom layer of parchment paper you originally rolled it out on, transfer to a large rimmed baking sheet. Using a pastry brush, brush the beaten egg over the exposed edges of the galette. Place the galette in the oven for 40-45 minutes, or until the crust has turned a lovely golden brown. Remove and let cool slightly. Sprinkle with additional chives and fresh oregano before serving. You can purchase the Bouchon Bakery cookbook here.